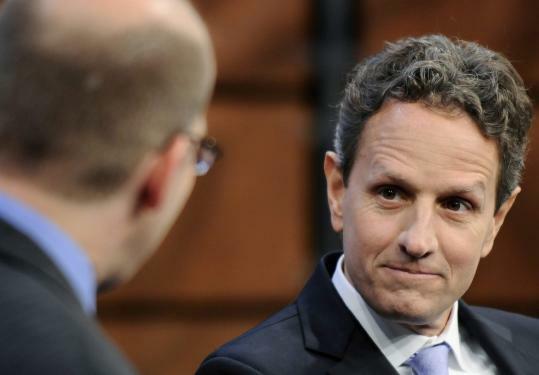 NEW YORK - Treasury Secretary Timothy F. Geithner suggested yesterday that House Republicans were engaging in ''political theater'' instead of true oversight in their questioning of Elizabeth Warren, the Obama administration adviser setting up the Consumer Financial Protection Bureau. Warren got into a verbal scuffle with the chairman of a House panel yesterday over scheduling and her previous congressional testimony, a sign of growing tension between her and Republicans over the agency's mission and structure. At the hearing, Representative Patrick McHenry, a North Carolina Republican, questioned the ''veracity'' of her previous statements about the bureau's role in foreclosure settlement talks. He and Warren also had a testy exchange about whether the committee pledged to a time limit on her appearance. President Obama in September tapped Warren to set up the consumer agency after Senate Banking Committee chairman Christopher Dodd, a Connecticut Democrat, said Warren could not win Senate confirmation to be its director. Less than two months before the agency's official start date of July 21, no nomination has been made. The bureau, which is under Treasury's auspices until it begins formal operations, has become a target of House Republicans. The Financial Services Committee on May 13 approved bills that would replace the director with a bipartisan, five-member board, delay its start date if there is no confirmed director, and ease the process by which other bank regulators can veto the bureau's rule-makings. This month, 44 Senate Republicans said in a letter to Obama that they would not vote for a director without changes to the agency's structure. That would prevent the Obama administration from obtaining the 60 votes it needs to confirm a nominee in the 100-member Senate. The White House has not publicly ruled out nominating Warren. Yesterday a coalition of activist groups and individuals began a petition drive and online advertising campaign to urge Obama to name her temporarily when Congress is out of session. The petition is signed by groups including the Sierra Club, an environmental lobby, and the Campaign for America's Future. At yesterday's hearing, McHenry accused Warren of misleading lawmakers about the bureau's role in the foreclosure talks. Warren answered that the bureau gave ''advice'' on the talks, which are taking place between state and federal officials and mortgage servicers including Wells Fargo & Co. and JPMorgan Chase & Co.
Toward the end of the hearing, Warren and McHenry got into an argument over whether she would remain past 2:15 p.m. to answer additional questions. Warren insisted the committee had promised she would be released by then, something McHenry denied. McHenry adjourned the hearing after Warren offered to answer additional questions for the record in writing. ''I share the Secretary's concerns about the integrity of our oversight process. Ms. Warren's behavior yesterday did a great disservice to this administration,'' McHenry said in an e-mailed statement yesterday.